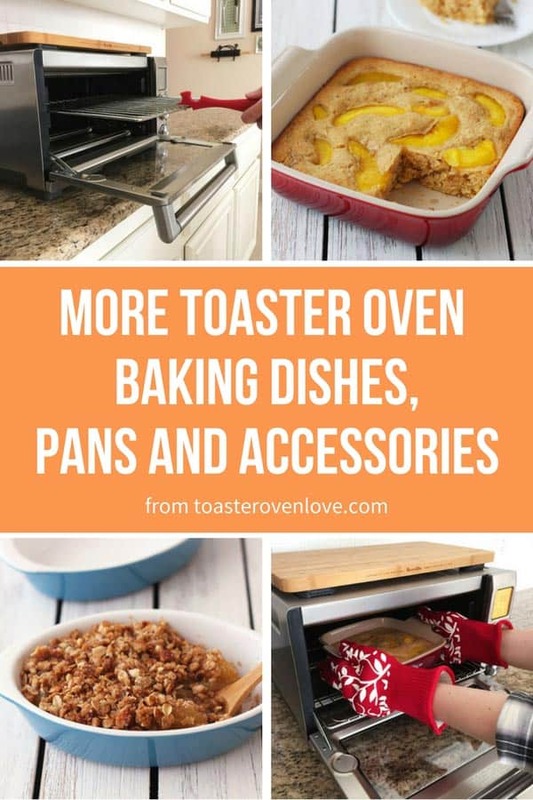 Have you been struggling to find toaster oven baking dishes? We’ve got a few new ideas for you plus fun pans and accessories for your little oven. You’re loving your new (or maybe new-to-you) toaster oven but…the little pan that came with it is limiting your recipe creativity. So you dig around in the cupboards looking for toaster oven-sized baking dishes. 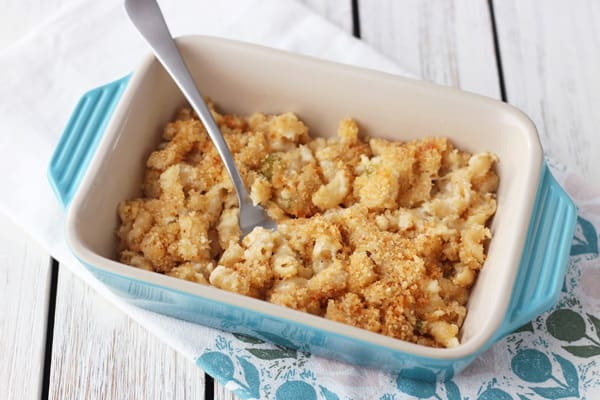 Your trusty 9 x 13 casserole dishes are way too big. Small 4-inch ramekins work but barely hold a handful of broccoli. Don’t worry, you’re not alone, it was a struggle for us too. It was a sad day in the Toaster Oven Love house when we learned that Pyrex warns not to use their products in a toaster oven. 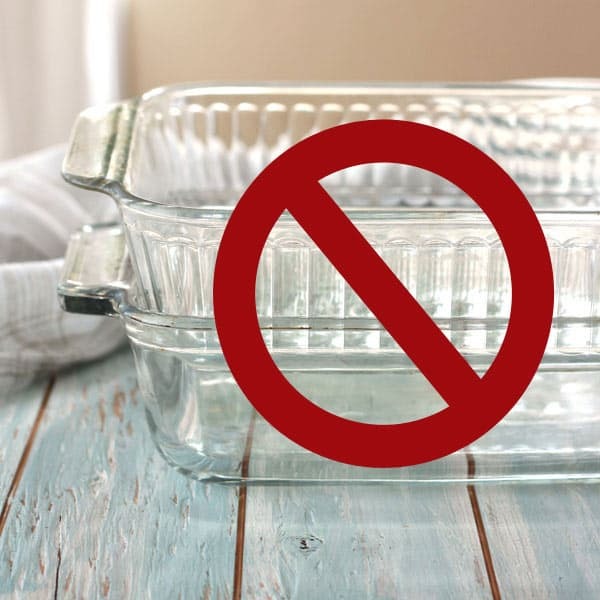 Since retiring our glass casserole dishes we’ve been on a search for suitable replacements and I’m happy to say we’ve found more than a few good candidates (along with some new pans and fun toaster oven accessories). Hopefully, one of these will work for you too. Starting with this all-purpose 1.7 qt. ; 8.5″ (9.75 with handles) x 8.5″ x 2.5″ Le Creuset Baker that’s made of an enamel coated stoneware. We’ve used it for baked pasta dishes and it did a great job cooking a toaster oven pancake with frozen peaches and orange zest (check out those crispy edges!). We got our baker from Sur La Table but you can also get it on Amazon. 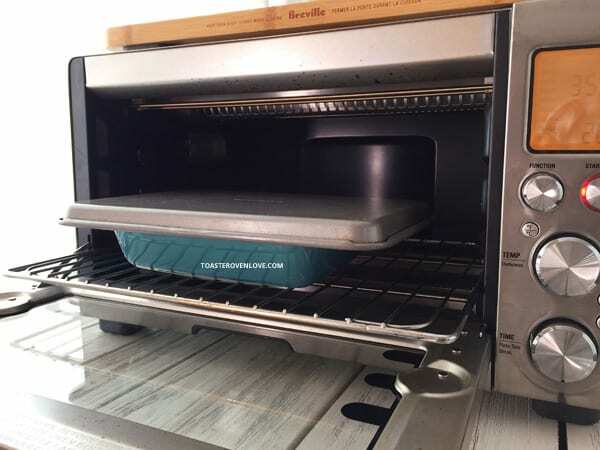 You may remember from our post on things you shouldn’t put in your toaster oven that Le Creuset said if you can fit them, their dishes are A-OK to use in a toaster oven. And they’re also listed among the recommended bakeware in The Gourmet Toaster Oven Cookbook. We purchased that large baker from Sur La Table as a set with this super cute matching 18 oz. ; 5.75″ (6.75″ with handles) x 5.75″ x1.75″ baker. It’s pretty small for a two-person household but I did use it to bake this tasty cornbread for one recipe from One Dish Kitchen. 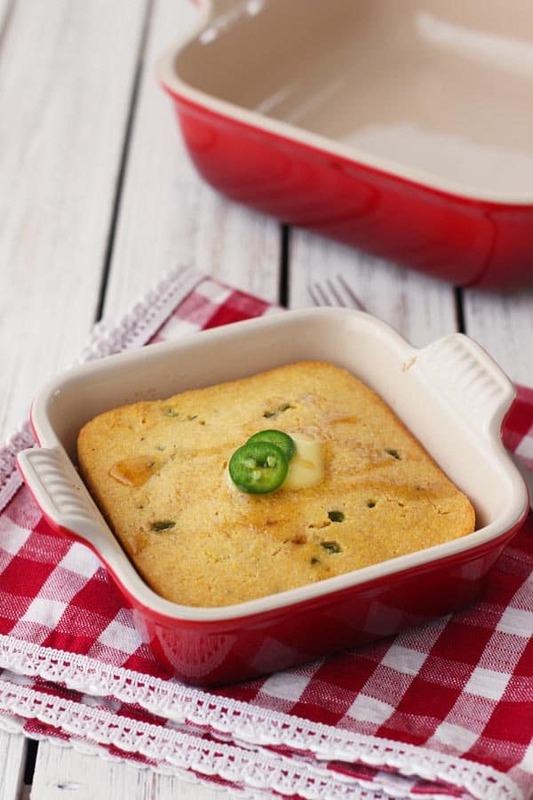 The instructions are for a big oven and say to cook the cornbread about 20 to 25 minutes. Using the Breville Smart Oven Pro (w/o the convection), our cornbread was done at 17 minutes, so check on yours early. If you’re not interested in the full set you can purchase just the 5.75 x 5.75-inch Baker on Amazon. 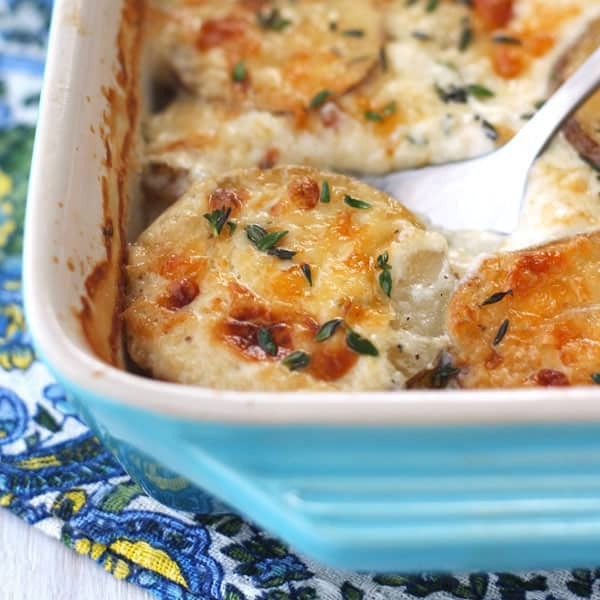 These stoneware Au Gratin pans are from Sur La Table but you can also get them on Amazon. They’re a perfect size (7″ x 5″ x 1.5″) for cooking little casseroles and crisps for one or two people. The first thing we cooked with them was a blueberry peach cobbler. After 30 minutes we had a pair of juicy sweet cobblers but our brand new dishes were covered (inside and outside) with a pink and blue baked-on sugary fruit syrup. I thought for sure they’d never get clean but after a quick soak and scrub, they looked brand new. While these do fall in the “keeper” category, given the choice, I’d probably pick the next pan over them. Right now this 7 x 5 Le Creuset baking dish is the most used dish in our house. According to Amazon, with the handles, it’s full measurements are 8.5 x 5 x 1.8 inches. It’s great for reheating one or two servings of leftovers and for cooking those small frozen meals where the box states the container for the food should not be used in a toaster oven. We just pry the food out of its container and plop it in the baking dish. I purchased it to test this special reader requested recipe for Toaster Oven Potatoes Au Gratin For Two. Always chat up the salespeople at your local kitchen supply store. They’re a great source of information and unique ideas. On our last trip to Sur La Table (it’s becoming an obsession) I was talking to the salesclerks about foil alternatives for covering dishes. Despite what it may seem, we are not an anti-foil household. 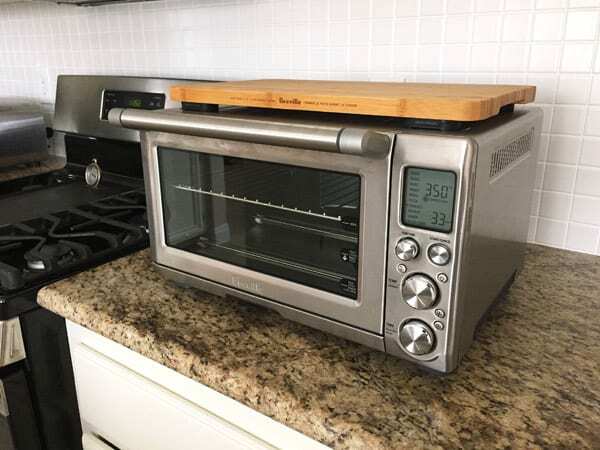 It’s just that one of our toaster oven’s manuals says not to use it so we’re always on the lookout for practical alternatives and we know you are too! The four of us involved in this “alternative foil think tank” came to the conclusion that covering the dish with another pan was probably the best solution. So for a few weeks now, Tim and I have been doing just that. With the 8×8 baking dish, we use an overturned quarter sheet pan or the metal pizza pan that came with our Breville Smart Oven Pro. For this 7×5 cutie, we use a 10 x 7-inch sheet pan that came in our Farberware toaster oven baking set. At first, it took a little getting used too, but so far, I’m sold on the idea. We haven’t used foil for weeks and recipes requiring covering are turning out great. Speaking of metal pans…the muffin tin that came in our Chicago Metallic Toaster Oven Set has been one of my favorite pans for years. But its handles are a real problem. They extend out the pan edges making it just a hair too large for many of your toaster ovens and our little Oster too. We’ve been working on a toaster oven muffins tips post (a reader request from the toaster oven cookie tips). 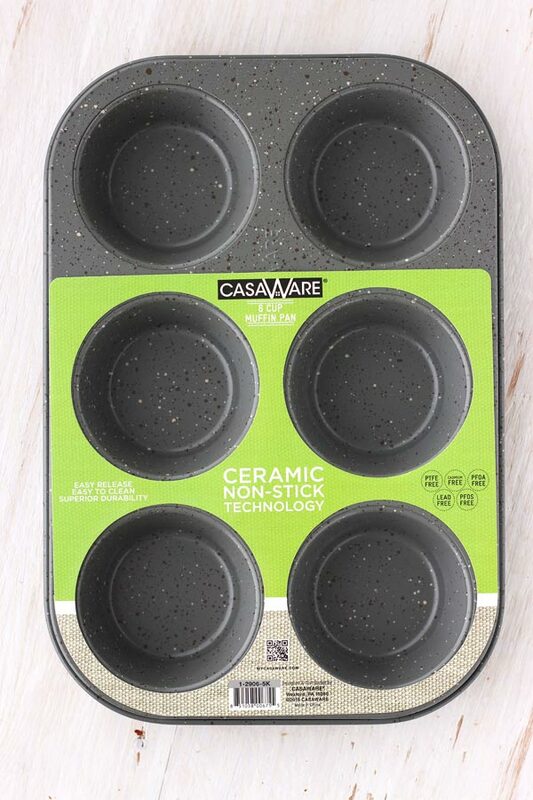 Wanting to make sure the tips will work in more toaster ovens than just our Breville, we busted out the tape measure and tracked down this 6-cup muffin pan from CasaWare on Amazon. I’ve only used it a few times but I’m already a fan. Though I do think the non-stick coating is browning the bottoms of our muffins more than usual. It’s hard to tell though when you bake with whole grain flours all baked goods tend to look a little over-browned. 11-16-2018 Update: Check out Our Big Fat Toaster Oven Muffin Experiment for our full review of this pan and snag some great toaster oven baking tips! Not too long ago, I bought this Wilton toaster oven pan on a whim at Bed, Bath, and Beyond. It’s 10 x 8.5-inch size seems like a nice middle ground between a large quarter sheet pan and the tiny 9-1/2 by 6-1/4-inch cookie sheet in the Chicago metallic toaster oven pan set. But we haven’t had a chance to give it a few good toaster oven cookie test runs yet. Do you own this pan? If you do, we’d love it if you shared your thoughts in the comments. And if you’re looking for more metal toaster oven pan ideas, check out our best toaster oven pans guide. “What I’m trying to find is a technique or tool for removing hot dishes safely. My husband has a shaky hand from a stroke (called intention tremor, it gets worse when he tries harder) and I’m just a clutz. 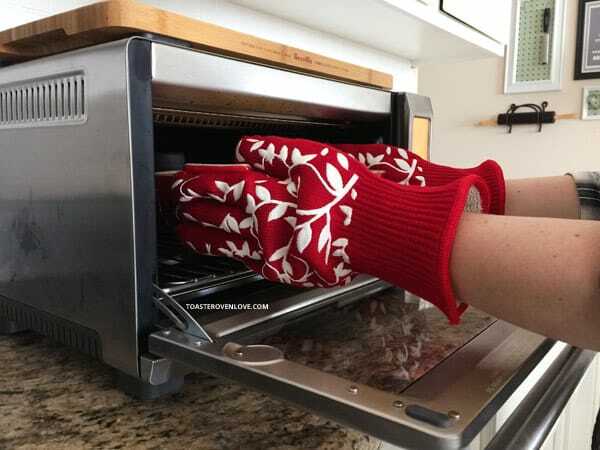 We love using the counter height toaster oven, but I can’t seem to get my hand around a casserole or muffin tin while wearing an oven mitt. We’ve been sliding it out by pulling out the rack until it tips, then nudging the dish onto an oven mitt, but if it topples, it would hurt! If you’ve got a great suggestion for Denise, can you do us a favor? Hop on over and leave a reply to her comment. 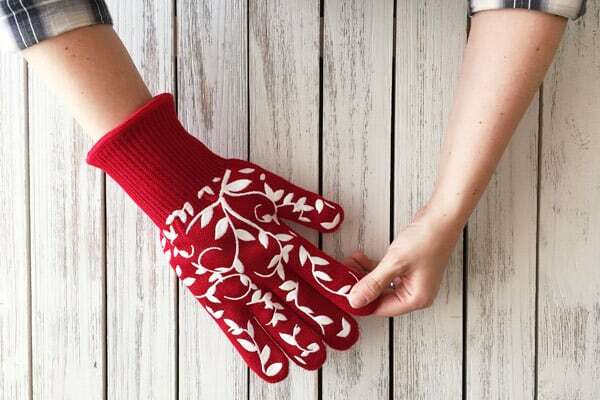 One of our ideas for Denise was these oven gloves from Sur La Table. They’re stylish, at least as stylish as oven gloves can be and I love that you can really use your fingers to grip dishes and pans. The big cuff at the top is the best. I used to accidentally burn my wrist a lot taking pans out of the toaster oven, now they’re well protected from my clumsy kitchen ways. One drawback though is how big the gloves are. Can you see where my thumb is pressing in the photo below? That’s where the tip of my index finger is. They fit Tim’s giant paws perfectly but are fairly large on my tiny child-sized hands. Although I wish they offered an option for smaller hands, overall I’m super happy with the flexibility and protection the gloves offer. And they’re so warm, come winter it might be hard to want to take them off…even when you’re not cooking. 5-8-2018 Update: Well it looks like they now make gloves for smaller hands too! You can find them in store or get a pair from Amazon. 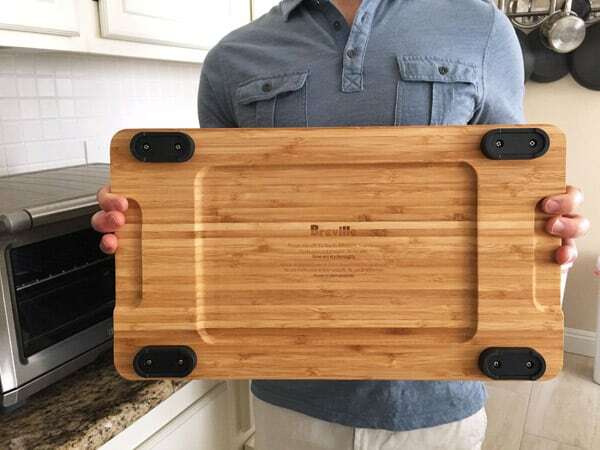 This cutting board had been on Tim’s wish list since we first purchased our Breville Smart Oven Pro. Given its higher price, I wasn’t totally sold at first. Then the paint on the cabinet door above our toaster oven started to bubble a little. After that, I got onboard and ordered the cutting board from Amazon. Seeing it in person, I think Breville is way underselling its quality-level and features. Aesthetics wise, the bamboo wood is nice and looks sharp paired with the toaster oven’s shiny metal. It feels well constructed too with rubber feet that are thick and sturdy. It’s definitely helping with the heat as the door hasn’t gotten any worse with our frequent toaster oven use. Having an extra place to set cooked food to cool is nice and we use it all the time as a serving tray too. If you already own a Breville XL or Smart Oven Pro, it’s an accessory worth considering. Now, this final toaster oven accessory proves I’m a total sucker for Amazon’s add-on suggestions. Those things are harder to resist than candy bars at the grocery checkout, right? The Norpro Silicone Oven Rack Push/Pull is a high-heat resistant…I want to say, device? 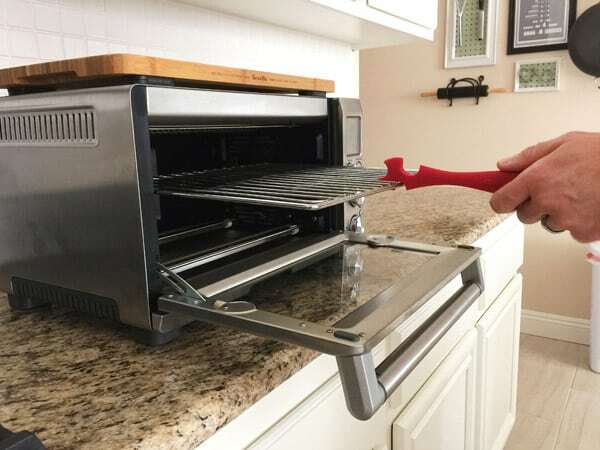 That helps you to grab and push the rack in and out of your toaster oven. 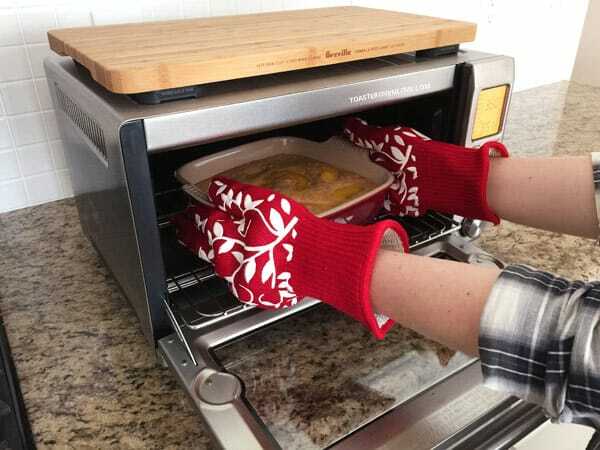 It’s pretty nifty and keeps you from sticking your hands deep in the toaster oven to grab a rack or pan. The problem is that for the life of me I cannot remember to use it, even when it’s sitting right next to the darn toaster oven. Do you own this little gadget? If so we’d love to hear how/if/when you use it. With all of these pans and accessories, the only thing left on our “Wish List” is a 2 or 3-quart coated cast iron dutch oven. I’ve been stalking Craigslist regularly keeping an eye out for just the right one. So far, I’m feeling a little like Goldilocks. Feb 11, 2018 Update: Welp, I caved and bought a new 2.75-quart shallow dutch oven at the end of last year. 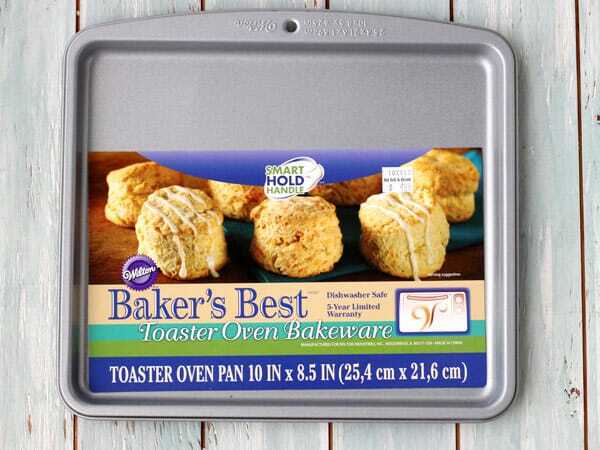 What toaster oven baking dishes and accessories are top on your Wish List? I bought the copper chef cookie sheet and I adore it. I have a larger toaster oven (oster) and it’s the perfect size and performs great. Thanks for the great tip, Jennifer! 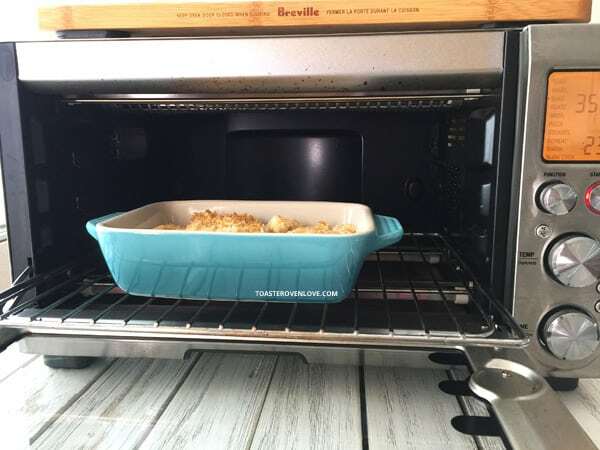 I have several pieces of Emile Henry porcelain cookware including the pie dish and two smaller casseroles that fit in my Breville mini-toaster oven. I emailed the cookware company to find out if they were toaster oven safe and they are. These are very expensive items and I buy them when I find them at an outlet store such as Tuesday Morning. The beauty of these pans, aside from the fact that they are pretty, is the incredibly easy cleanup – even with an au-gratin these wipe clean with no scrubbing. Deborah, thanks for taking the time to share your favorite bakeware and places to look for discounts on them! Can I use toaster oven bakeware in a conventional oven? You should always read the manufacturer’s instructions that came with your bakeware but I can’t see why it wouldn’t work in a conventional oven. I’ve used most of the baking dishes mentioned above, some mini pans, and the metal rack and pan from the Chicago Metallic set in our big oven a few times without any problems. THANK YOU SO MUCH for your great suggestion re: covering items with a metal pan instead of aluminum foil. Had always used foil with no problem in my original Oster toaster oven, but the one I had after that & my new Breville both do not cook items that are covered tightly with foil–seems like the heat deflects away from the foil (doesn’t matter if it’s shiny side in or out) and the food is not done in the middle at all. Had called the 800#’s for both toaster ovens & asked alot of friends that cook in toaster ovens and no one could come up with a good solution. What I found to work was to let the food get hot first & then loosely set a piece of foil on top to keep the top from browning too fast. It’s just a bit inconvenient, though, because you have to be available 20-30 mins. after starting the food to go back & tent it with the foil. I don’t know why none of this thought of your idea–you provided the simple solution that had escaped all of us! Thanks, again, will definitely try this! Yay, Lin! Glad we could help 🙂 Happy cooking! I am considering a Breville Mini Smart toaster oven for use in our small motorhome as well as for toasting/small batch baking at home. I have a few appropriately size pans, but the are inexpensive aluminum and I’d like something of better quality. I do have a USA Pans loaf pan that will fit. It appears the oven will take 11″x10″ size, although the back of the oven has a cutout to extend the depth to accommodate an 11″ pizza pan (I think!). 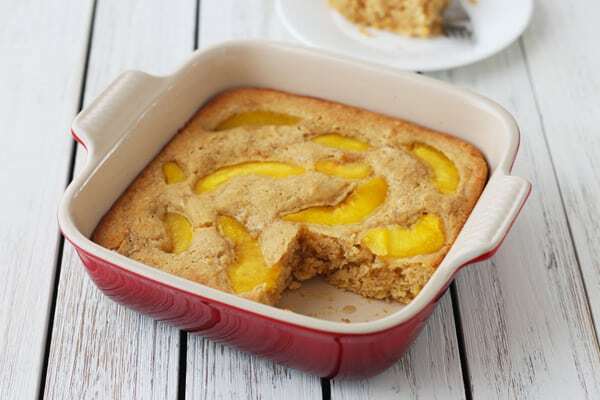 Any suggestions for similar quality cookie sheet and 6-cup muffin pan? Can the pan touch the sides of the oven? Just like cooking with a traditional oven, you want to leave room between the pan and the oven’s walls. This way the warm air can circulate evenly and cook your food evenly. There are a few high-quality toaster oven muffin pans sold at Sur La Table and Williams Sanoma but they are over 11-inches. In the reviews for this USA Muffin Pan (https://www.amazon.com/USA-Pan-Bakeware-Nonstick-Aluminized/dp/B00TUHMT3K/) there are a few mentions of it fitting in a Breville Mini but the dimensions look a little large so I couldn’t say for sure. If possible, you might want to visit a Williams Sanoma or department store that carries the Mini and try a few of their pans in a display model. Thank you for this excellent article! I just purchased a very small, relatively low wattage toaster oven for my camper and have been having a terrible time finding bakeware to fit in it. You solved that problem for me with many of the items listed here. The muffin tin won’t work for me, but I decided to search online for a 4-cup muffin tin and they exist! So that along with the 7×5 Le Creuset that’s shown in this article covers most of my baking ware needs. Yay, Christine, that’s fantastic! 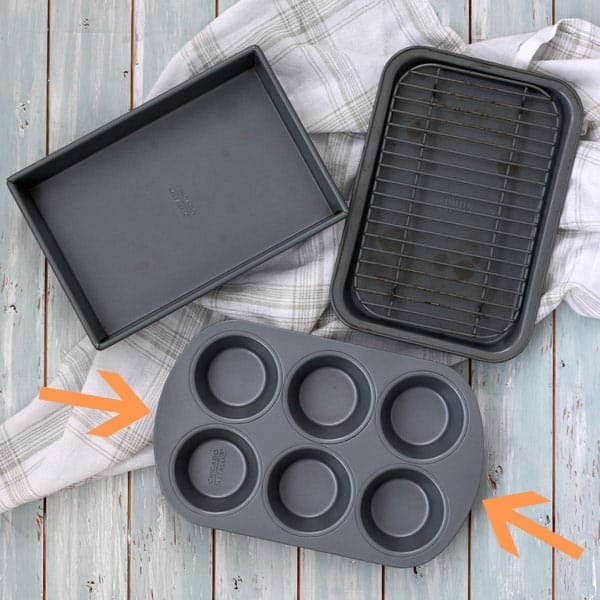 The 4-cup muffin tin is genius and such a great ideas for smaller toaster ovens, thanks for sharing your awesome find! https://www.amazon.com/Portmeirion-Sophie-Conran-White-Rectangular/dp/B000IOCYMA/ <– this is the one I use most often — PERFECT for 2 servings of lasagne! Also works great for fruit crisp, cobblers, etc. The ones I have are white, but some of them come in celedon as well. I saw no warnings about use in toaster ovens, and I've been using them for 9 yrs (my first one was the White Rectangular Pie Dish — purchase on Amazon February 28, 2008). A tad pricey, but very elegant and so nice to use! (I'm not an affiliate or have any connections at all to Portmeirion — I just love these baking dishes).